MSU scientists have developed a vaccine to protect catfish from commonly occurring bacteria that can cause death. During their first growing season, every catfish fingerling raised in the Mississippi Delta will be exposed to Edwardsiella ictaluri, the bacteria that causes enteric septicemia, or ESC. MSU’s vaccine and delivery method were developed at the Thad Cochran Warmwater Aquaculture Center and received a provisional patent in 2013. In 2013, catfish farms covered 48,600 surface acres of ponds across the state of Mississippi. The production across 125 operations totaled $178 million. ESC is estimated to reduce production by 25-30 percent costing the industry $30-40 million annually. ESC outbreaks typically occur in late summer or early fall as water temperatures begin to cool. Some ESC cases in infected catfish are mild while other cases lead to death. ESC causes a red rash and internal and external hemorrhaging, while an accumulation of fluid causes the catfish’s abdomen to swell. At this point, the catfish either clears the infection or it transitions into a chronic disease that localizes in the brain. It can cause a hole in the head exposing the brain, eventually leading to death. The chronic infection occurs in, and subsequently kills, five to 20 percent of the surviving population that goes through an outbreak. Fish that are exposed to the pathogen and survive develop an immune response and are subsequently protected from future exposure. The spread of the bacteria can be slowed by cutting off feed during the spring and fall when the chance of an outbreak is greater. However, not feeding the catfish slows growth and increases the time required to produce a marketable-sized fish. Growers can also use medicated feed to control losses but medicated feeds are expensive and infections can be difficult to treat because sick fish do not eat once clinical signs of the disease are present. Vaccination protects the catfish by exposing them to a weakened form of the bacteria that stimulates development of an immune response without causing the disease. When vaccinated fish are later exposed to the fully virulent wild strain, their immune system is able to prevent infection. The vaccination allows growers to continue to feed throughout the fall and achieve greater weight gains and full production. 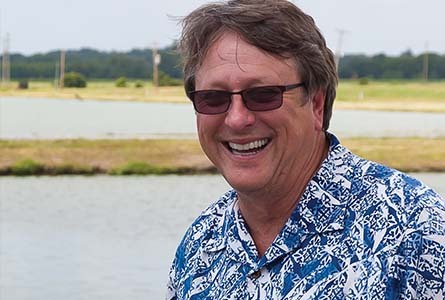 In 2008, David Wise, MAFES aquaculture scientist developed the live-attenuated vaccine and developed a method of delivering the vaccine orally with commercially available feed. Over the next few years, the new oral delivery method was shown safe and effective in laboratory tests, small pond trials, and ultimately, commercial-scale field trials. Protocols for vaccine production and processing were developed and validated in the field trials. 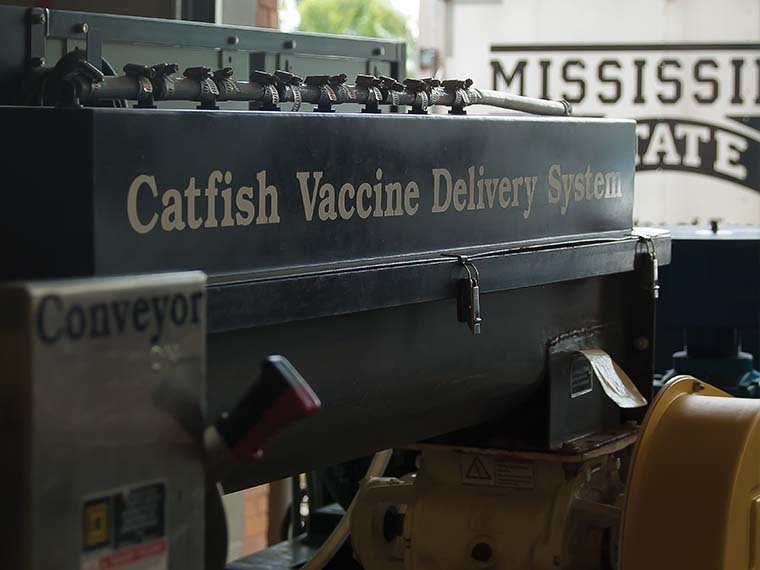 By 2012, the team was using a catfish vaccine delivery system developed by MSU agricultural and biological engineers in field trials. In 2014, the team used a new commercial-scale delivery system developed by the same group. In order to protect catfish against ESC, researchers took an active culture from sick catfish in the Delta and weakened it. Once weakened, bacteria lose the ability to cause disease and instead create a very mild sub-clinical infection that immunizes the catfish. The catfish clears the mild infection and is protected against subsequent infections. Bacteria outbreaks typically occur in the fall. The only time researchers can manipulate the catfish is when they leave the hatchery as fry or leave the nursery pond as adult catfish. Previously, fry had been vaccinated through immersion baths at seven to ten days old. The fry were too young with underdeveloped immunity so the vaccine, while providing some protection, was not considered effective. The immersion baths as the fish left the hatchery weren’t effective and fish coming out of the nursery ponds were already exposed to the bacteria. The new vaccine and method allowed researchers to vaccinate a fully developed fish in the nursery pond. There is a window of time between mid-July and mid-August when researchers vaccinate the catfish. The vaccine needs to be administered before the pond temperature dips below 28 degrees Celsius. ESC thrives below that temperature and that is when outbreaks typically occur. The catfish must be 50 to 70 days old and able to eat the feed pellets. The feed is a carrier for the vaccine. If the catfish doesn’t eat, it doesn’t get vaccinated. The team started off mixing the vaccine and feed in a little bucket in a small pond. They ran a study and it worked. The team proved the concept in five-gallon buckets but needed a better delivery system. You can't vaccinate a 10-acre pond with a five-gallon bucket," Wise said. "We had to come up with a method of mixing and administering the vaccine in 500, 800, or 1000 pounds of feed at a time. The challenge lied in the vaccine itself. It has to be live to work. Once the vaccine is absorbed into the feed, researchers have 15 to 20 minutes before it starts losing viability. The team used a modified seed coater mounted onto a conventional blower on 1-acre ponds. They were able to mix up 150 pounds of feed in a batch but needed something on a commercial scale. Wise reached out to MSU’s agricultural and biological engineering department. Jeremiah Davis, MAFES agricultural engineer, worked with research associates to develop the first catfish vaccine delivery system. They finished the prototype in six months just in time to start vaccinating the fish. The feed is loaded into a modified feeder and then passes through a system where the live vaccine is added; the feed absorbs the vaccine and runs through an airlock system that blows the feed into the pond. The delivery system is on a trailer so it can be moved from pond to pond. The first delivery system holds up to 1000 pounds of feed and can administer feed to two 8-acre ponds before reloading. The engineering team recently finished work on a larger catfish vaccine delivery system that holds 2000 pounds of feed and feed up to four 8-acre ponds before reloading. They tweaked some of the design based on what they learned the first time around. Researchers estimate about 75 percent of a pond population ingests the feed and subsequent vaccine. The dose is safe and consistent. It only takes one dose to vaccinate the catfish. Survival and size of the catfish both increased as a result of the vaccine. The feed conversion ratio was also reduced from approximately 2.5 to 1.5, meaning that it takes a full pound less feed to produce a pound of fish. The team has seen similar results in repeated pond trials that have resulted in 2-3 fold increases in projected gross sales. The data required to support a USDA licensing application that would make the vaccine commercially available is currently being collected in the commercial-scale field trials.